Everything’s better in 3D, including drafting for the steel framework of commercial or industrial building construction. 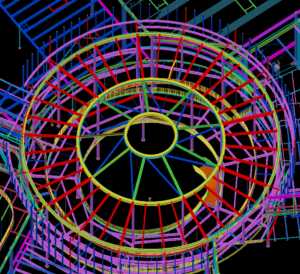 As a major supporter of construction planning and tasks, having a 3D model of a steel framework is invaluable. Building Information Modeling, or BIM, means advanced 3D modeling involves all project stakeholders in a process that maximizes the coordination of various specialties in the construction process to work from the same model. Utilizing AutoCAD and a Microstation platform, clients and colleagues alike enjoy a fully intuitive model of the building during every phase of the construction process. It’s much easier to translate complicated structures with a multi-material modeler that’s integrated to the project as a whole. At Tectonix, expert steel detailers produce easy-to-understand drawings and instantly assemble connections within the framework using Tekla Structures. Utilizing the latest technology, 3D modeling software can be used from the earliest stages of drafting until the completion of the project. With software that was designed by engineers who have a background in steel design, 3D structural steel work has never been easier to design, change, and translate for everyone involved in the project, from welders to clients. In essence, 3D modeling is just what it sounds like and much more—it allows the designer to build a model from the ground up with three dimensions instead of two, allowing for more information and insight from stage one onward. In addition, it provides multiple lists and reports, and is flexible to incorporate alterations to the initial plan while checking for the integrity of the entire structure. Comparing 2D modeling to 3D is nearly an apples vs. oranges debate. With 3D, everyone from structural engineers to fabricators and project managers have a hand in updating, changing, and revising modeling to ensure the best possible framework. Automatic creation and storage of the documentation makes sure that nothing is lost, and an “open environment” guarantees that the interface is standardized throughout the process. There won’t be duplicates floating around or outdated drafts getting in the way. This in turn leads to optimized productivity, decreased waste and of course, more profitability for everyone involved. Everything from stairs to HVAC venting, handrails to elevator shafts, can be captured. Even older 2D drawings can be transferred into a 3D model along with complementary data, if needed. Customized 3D modeling with Tekla Structures maximizes workflow, enabling detailers to work with even the most complex of frameworks, and maximizes teamwork for all construction professionals involved. Taking a 3D modeling approach is completely different than 2D, which is why it’s so important for clients to choose a company that not just specializes in 3D, but keeps up to date with the latest advances. No matter which software program is used, building a project in 3D prior to the production of shop drawings is hands down the best way to manage a major structural steel construction job.